While some dentists may find it easy to relate to their adult patients, it takes a different kind of dentist to care for pediatric patients. Good dental hygiene starts in childhood. The habits that your child learns now, like brushing and flossing twice daily, and limiting sweets, are the groundwork for dental health. What most Monrovia parents don’t realize is that their child’s first appointment with the pediatric dentist should be around the age of one. While your toddler may not have many teeth, he or she will benefit from getting them checked to discover potential problems before they get bigger. At such a young age, it’s rare that X-rays, will be required and the appointment will be much shorter than for an older child or adult. After this appointment, you’ll be 100% sure that your child’s teeth are healthy. Some kids may need a cleaning, but this exam is more of a meet and greet to introduce your child to good dental health habits. Like adults, children should visit the pediatric dentist every six months for good dental health and to catch any problems in the early stages. As your child gets older, the exams will be longer and eventually require X-rays to check for signs of decay. Our office in the Monrovia area features modern dental equipment such as digital imaging and Cariview, a small infrared camera that detects decay so small it can’t be seen on X-rays. Your child won’t have to sit through conventional X-rays that require them to bite down and cause serious discomfort. What Procedures Can a Pediatric Dentist Perform? Pulpotomy: Part of the pulp is removed, but the rest is sealed and preserved. This is also known as a mini root canal. Sealants: Filling cracks in teeth to prevent decay from damaging teeth. Fillings: Removing tooth decay and replacing the tooth structure with composite that is safe and protects the sensitive parts of the tooth. Extractions: Gently pull teeth causing your child discomfort or blocking other teeth from emerging. If you child is scared or nervous of their procedure, like most children are, we offer nitrous oxide (laughing gas) as a safe and effective way to calm them. Unlike other forms of sedation dentistry, nitrous oxide wears off within a few minutes of removal so that your child can get back to normal soon after their procedure. At our practice, we seek to explain dental care in a way that children understand. Dr. Q’s friendly attitude and motherly care helps settle even the most nervous children. As the mother of two children, Dr. Q understands how to relate to children and make them comfortable with any procedure. During a consultation, she will spend more time finding out what might be causing dental problems and explain how to prevent them. As a firm believer in preventative treatment, she shows pediatric patients the right way to brush and take care of their teeth to avoid future problems. Dr. Q has over ten years of experience as a cosmetic and general dentist for children and adults. As the mother of two children, she has a way of speaking to kids that puts them at ease. Her practice is built around creating a comfortable atmosphere to take the fear and anxiety of a visit to the dentist. We are active in the Monrovia community, taking part in local volunteer and team-building activities that promote wellness and serve those in need. 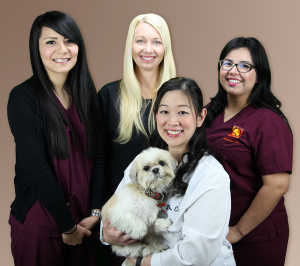 Our team will help your child develop healthy teeth and treat them through all stages of their life. To schedule an appointment for your child, call our office in the Monrovia area at 626-599-9818.